SEOUL, March 21 (Yonhap) -- President Moon Jae-in on Wednesday floated the possibility of a three-way summit among the two Koreas and the United States. "Holding a North Korea-U.S. summit following a South-North Korea summit itself is a historical event. And depending on their outcomes, they may lead to a three-way summit of South, North and U.S.," Moon said while attending a meeting of Seoul's preparation committee for the upcoming inter-Korean dialogue, held at his office Cheong Wa Dae. "We must completely resolve the issues of denuclearizing the Korean Peninsula and establishing peace through these upcoming talks and others that will follow," he added, according to Cheong Wa Dae pool reports. Moon is scheduled to hold a bilateral summit with North Korean leader Kim Jong-un late next month, while U.S. President Donald Trump said he will meet Kim before the end of May. The historic summits were arranged by a group of Moon's special envoys who traveled to the communist North on March 5-6. Moon underscored the importance of the U.S.-North Korea summit, noting its success may well determine the fate of his country, as well as North Korea. Denuclearization, he said, "is not something that can be realized only through an agreement between the South and the North. It requires a U.S. guarantee, and that would require normalization of the North-U.S. relationship or even economic cooperation between the two." 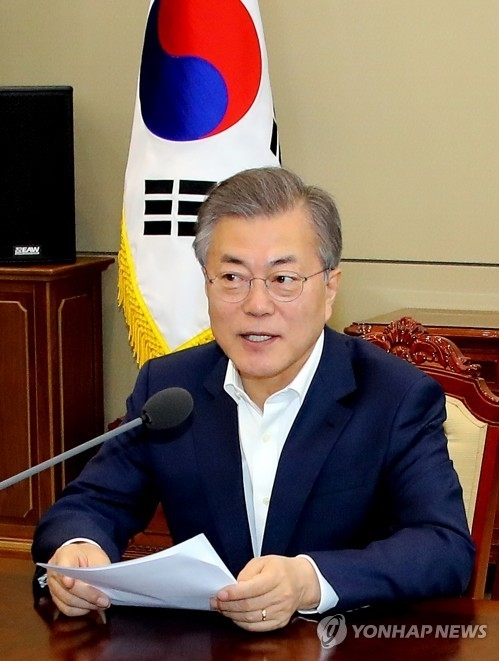 "I ask you to prepare for the talks with such an objective and vision," Moon told the preparation committee, according to Cheong Wa Dae spokesman Kim Eui-kyeom. He also told the preparation committee to clearly show what North Korea, as well as the U.S., will gain through a peaceful resolution of the North Korean nuclear issue. "I ask you to make preparations so that we can show and persuade, from an objective point of view, how the South, the North and the U.S. may each benefit and how they may exchange such benefits," the president said, according to the pool reports. Moon noted the upcoming talks, especially the U.S.-North Korea summit, will mark an "unexplored path." Still, their objective and how to achieve that may be very clear, he said. "Though it is an unexplored path we have never walked, we have clear plans and a clear vision of goals we seek to achieve through an agreement between the leaders of the South, North and the U.S.," Moon said. "They may be the denuclearization of the Korean Peninsula, a permanent peace regime on the Korean Peninsula and the normalization of the North-U.S. relationship, development of South-North Korean relations and economic cooperation between the North and the U.S. or the North, U.S. and South Korea," he added. Moon also highlighted the need to have any agreement with the communist North ratified by the parliament, so the agreement will be honored regardless of any possible change in leadership in South Korea. "We must institutionalize what is agreed upon at the South-North Korean submit," he told the preparation committee, according to the Cheong Wa Dae spokesman. "We must have them ratified by the National Assembly so they will continue to be pursued even if there should be a change in political conditions." Moon's upcoming summit with Kim will mark the third inter-Korean summit. The two previous summits, held in 2000 and 2007, led to what were then considered exceptional and historical rapprochement between the divided Koreas, such as the construction of a joint industrial complex in Kaesong, North Korea. The Kaesong complex, which flourished under South Korea's late former President Roh Moo-hyun, was shut down under ousted former conservative leader Park Geun-hye in 2016 and remains shut to date. The two Koreas technically remain at war as the 1950-53 Korean War ended with an armistice, not a peace treaty. Meanwhile, the preparation committee has decided to propose holding high-level dialogue with North Korea next Thursday to discuss details of the upcoming inter-Korean summit, according to the Cheong Wa Dae spokesman. Seoul hopes to hold the inter-Korean dialogue in the joint security area of Panmunjom, which is also the venue for the envisioned inter-Korean summit, Kim told a press briefing. The proposal will soon be delivered to North Korea by Seoul's unification ministry, he added.